NASA managers today reviewed plans to fix a leaking hydrogen vent line and decided to implement an expedited repair procedure that, if all goes well, will permit a launch attempt at 7:43:44 p.m. Sunday to kick off a delayed space station assembly mission. The flight plan calls for Discovery to dock with the space station on Tuesday and for the astronauts to carry out three of four originally planned spacewalks to attach a final set of solar arrays and to perform a variety of get-ahead tasks for upcoming assembly missions. The original flight plan called for a four-spacewalk mission two-week mission with two light-duty days. But to avoid conflict with an upcoming Russian mission to fly up two fresh crew members and bring two other crew members back to Earth, the docked phase of Discovery's mission must be completed by March 25. Originally scheduled for launch Feb. 12, Discovery has been repeatedly delayed, first by problems with suspect flow control valves in the system used to pressurize the shuttle's external tank and again on Wednesday by a leak in a gaseous hydrogen vent line. Based on past repair experience, a seal in the vent line system must be tightened down after reassembly and allowed to sit for an extended period to correct for possible misalignments during installation. That would have delayed launch to Monday. But engineers decided today they could properly torque the seal in place faster than that, and mission managers opted to press for a Sunday launch. While the astronauts will have to eliminate one of their planned spacewalks in order to complete the docked mission by March 25, NASA managers decided to add a day of off-duty time after undocking to give the astronauts a bit of a break before landing back at the Kennedy Space Center on March 28. 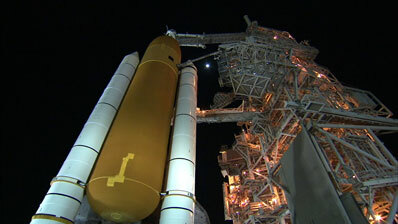 Discovery must be off the ground by Tuesday or the flight will be delayed to around April 7. But a launch Monday would force the crew to eliminate two spacewalks while a Wednesday takeoff would require the elimination of three EVAs in order to ensure an undocking on March 25. An updated flight plan, countdown timeline and other mission information will be posted as soon as possible.